Smile! Teeth Whitening is safe, effective - and can make you look years younger! 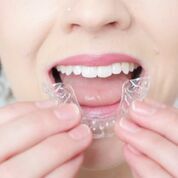 Straighten your teeth with Smilelign invisible braces. Our principle dentist David Macpherson is currently offering free consultation appointments for Smilelign treatment.